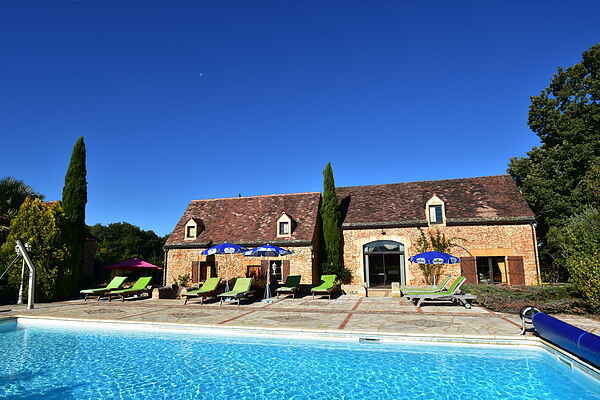 Enjoy your holiday in a two hundred year old Dordogne farmhouse? This beautiful home near Marminiac (2 km) makes this possible. Here you will enjoy a heated pool, unobstructed views of the fields and indoors you will have access to a spacious lounge and kitchen. The house comprises two upper levels, one is accessible via the live-in kitchen and the other from the dining room. This French region is stunningly beautiful. This is partly due to the fact that many of the villages were able to maintain their medieval character. Villefranche-du-Périgord (11 km) is a good example of this. Its lovely covered market and magnificent church make this a place worth visiting. The old church of picturesque Besse (8 km) is also worth visiting. The forests around Besse are an open invitation for taking long walks. Cazals is a little under six kilometres away. Here you will find both an excellent bakery and lovely lake for swimming. The area is practically bursting at the seams with historical sights. The caves of Les Eyzies-de-Tayac-Sireuil (46 km), magnificent Château de Bonaguil (29 km) and the splendid town of Cahors are well worth the effort.